このチュートリアルでは、Azure CDN エンドポイントに関連付けられたカスタム ドメインの HTTPS プロトコルを有効にする方法について説明します。This tutorial shows how to enable the HTTPS protocol for a custom domain that's associated with an Azure CDN endpoint. カスタム ドメイン (例: https://www.contoso.com) で HTTPS プロトコルを使用すると、インターネット経由での送信時、機微なデータが TLS/SSL 暗号化でセキュリティ保護されて配信されます。By using the HTTPS protocol on your custom domain (for example, https://www.contoso.com), you ensure that your sensitive data is delivered securely via TLS/SSL encryption when it is sent across the internet. Web ブラウザーが HTTPS 経由で Web サイトに接続しているときに、Web サイトのセキュリティ証明書を検証し、正当な証明機関によって発行されていることを確認します。When your web browser is connected to a web site via HTTPS, it validates the web site’s security certificate and verifies it’s issued by a legitimate certificate authority. このプロセスによりセキュリティを確保し、Web アプリケーションを攻撃から保護します。This process provides security and protects your web applications from attacks. 既定では、Azure CDN は、CDN エンドポイント ホスト名で HTTPS をサポートしています。Azure CDN supports HTTPS on a CDN endpoint hostname, by default. たとえば、CDN エンドポイント (例: https://contoso.azureedge.net) を作成すると、HTTPS が自動的に有効になります。For example, if you create a CDN endpoint (such as https://contoso.azureedge.net), HTTPS is automatically enabled. 追加コストなし: 証明書の取得または更新のコストや、HTTPS トラフィックの追加コストは発生しません。No additional cost: There are no costs for certificate acquisition or renewal and no additional cost for HTTPS traffic. CDN からの GB 送信のみ課金されます。You pay only for GB egress from the CDN. 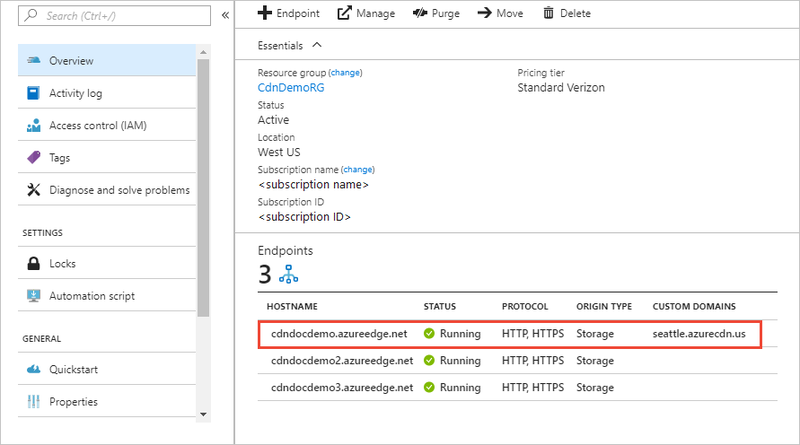 シンプルな有効化: Azure portal からワン クリックのプロビジョニングを利用できます。Simple enablement: One-click provisioning is available from the Azure portal. REST API やその他の開発者ツールを使用して機能を有効にすることもできます。You can also use REST API or other developer tools to enable the feature. 証明書の完全な管理: すべての証明書の調達と管理がユーザーに代わって実施されます。Complete certificate management is available: All certificate procurement and management is handled for you. 証明書は自動的にプロビジョニングされ、有効期限になる前に更新されます。これにより、証明書の期限切れによりサービスが中断されるリスクがなくなります。Certificates are automatically provisioned and renewed prior to expiration, which removes the risks of service interruption due to a certificate expiring. カスタム ドメインで HTTPS プロトコルを有効にする。Enable the HTTPS protocol on your custom domain. カスタム ドメインで HTTPS プロトコルを無効にする。Disable the HTTPS protocol on your custom domain. Azure CDN カスタム ドメインでコンテンツを安全に配信するために HTTPS プロトコルを有効にするには、SSL 証明書を使用する必要があります。To enable the HTTPS protocol for securely delivering content on an Azure CDN custom domain, you must use an SSL certificate. 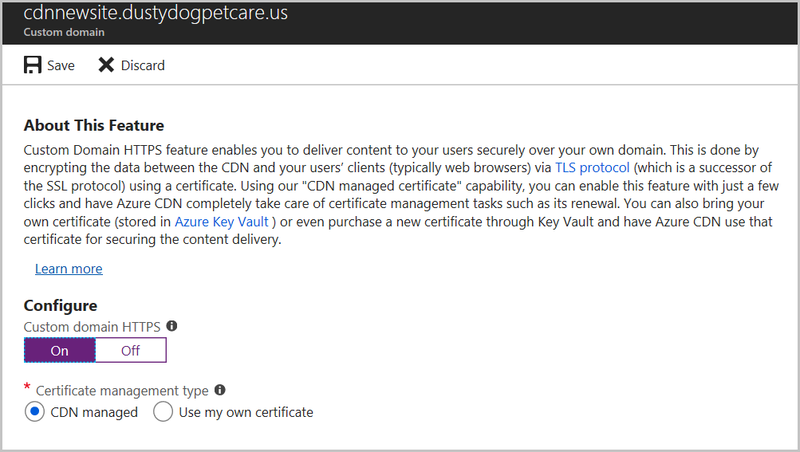 Azure CDN で管理された証明書または独自の証明書を使用できます。You can choose to use a certificate that is managed by Azure CDN or use your own certificate. CDN で管理された証明書を使用する場合、HTTPS 機能は、数回クリックするだけで有効にできます。When you use a CDN-managed certificate, the HTTPS feature can be turned on with just a few clicks. 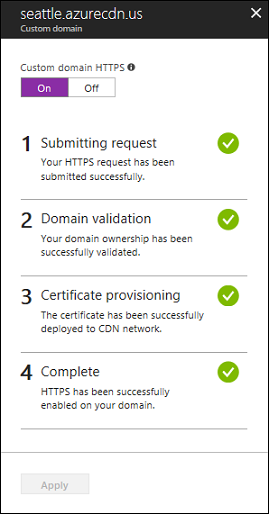 Azure CDN は、調達や更新などの証明書管理タスクを完全に処理します。Azure CDN completely handles certificate management tasks such as procurement and renewal. この機能を有効にすると、プロセスがすぐに開始します。After you enable the feature, the process starts immediately. カスタム ドメインが既に CDN エンドポイントにマップされている場合、これ以上のアクションは必要ありません。If the custom domain is already mapped to the CDN endpoint, no further action is required. Azure CDN によって手順が処理され、要求が自動的に完了します。Azure CDN will process the steps and complete your request automatically. 一方、カスタム ドメインが別の場所でマップされている場合は、電子メールを使用してドメインの所有権を検証する必要があります。However, if your custom domain is mapped elsewhere, you must use email to validate your domain ownership. Azure portal で、お使いの Azure CDN Standard from Microsoft、Azure CDN Standard from Akamai、Azure CDN Standard from Verizon、Azure CDN Premium from Verizon のいずれかのプロファイルを参照します。In the Azure portal, browse to your Azure CDN Standard from Microsoft, Azure CDN Standard from Akamai, Azure CDN Standard from Verizon or Azure CDN Premium from Verizon profile. CDN エンドポイントの一覧で、カスタム ドメインが含まれているエンドポイントを選択します。In the list of CDN endpoints, select the endpoint containing your custom domain. [エンドポイント] ページが表示されます。The Endpoint page appears. カスタム ドメインの一覧で、HTTPS を有効にするカスタム ドメインを選択します。In the list of custom domains, select the custom domain for which you want to enable HTTPS. [カスタム ドメイン] ページが表示されます。The Custom domain page appears. [証明書の管理の種類] で、[CDN 管理] を選択します。Under Certificate management type, select CDN managed. [オン] を選択して HTTPS を有効にします。Select On to enable HTTPS. ドメインの検証に進みます。Proceed to Validate the domain. このオプションは、Azure CDN Standard from Microsoft プロファイルでのみ利用できます。This option is available only with Azure CDN Standard from Microsoft profiles. 独自の証明書を使用して、HTTPS 機能を有効にできます。You can use your own certificate to enable the HTTPS feature. このプロセスは、Azure Key Vault との統合を通じて行われます。これにより、お使いの証明書を安全に格納できます。This process is done through an integration with Azure Key Vault, which allows you to store your certificates securely. Azure CDN では、お使いの証明書の取得に、セキュリティで保護されたこのメカニズムが使用されます。それには、追加の手順がいくつか必要です。Azure CDN uses this secure mechanism to get your certificate and it requires a few additional steps. SSL 証明書を作成するときには、許可された証明書機関 (CA) を使用して作成する必要があります。When you create your SSL certificate, you must create it with an allowed certificate authority (CA). 許可されていない CA を使用すると、要求が拒否されます。Otherwise, if you use a non-allowed CA, your request will be rejected. 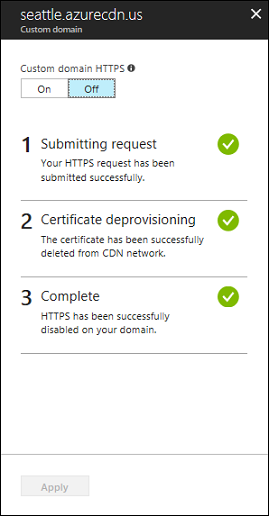 許可された CA の一覧については、「Allowed certificate authorities for enabling custom HTTPS on Azure CDN」(Azure CDN でカスタム HTTPS を有効にするために許可された認証機関) を参照してください。For a list of allowed CAs, see Allowed certificate authorities for enabling custom HTTPS on Azure CDN. 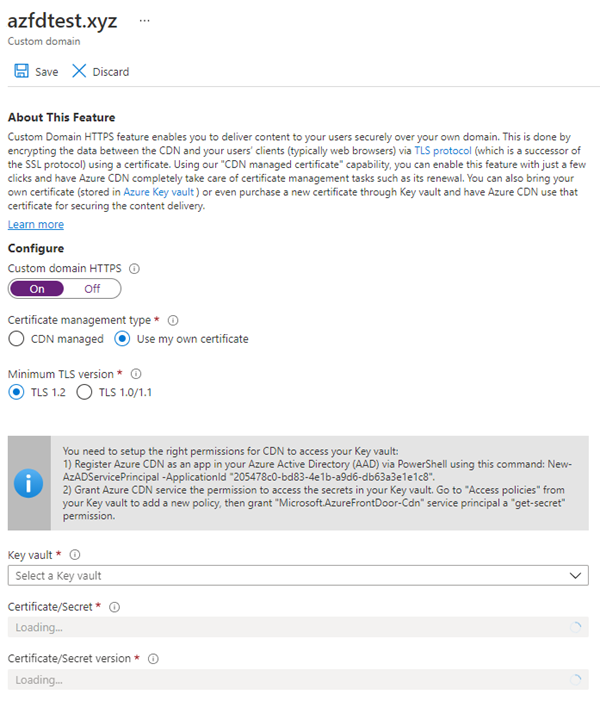 Azure Key Vault: カスタム HTTPS を有効にする Azure CDN プロファイルおよび CDN エンドポイントと同じサブスクリプションで、Azure Key Vault アカウントを実行している必要があります。Azure Key Vault: You must have a running Azure Key Vault account under the same subscription as the Azure CDN profile and CDN endpoints that you want to enable custom HTTPS. 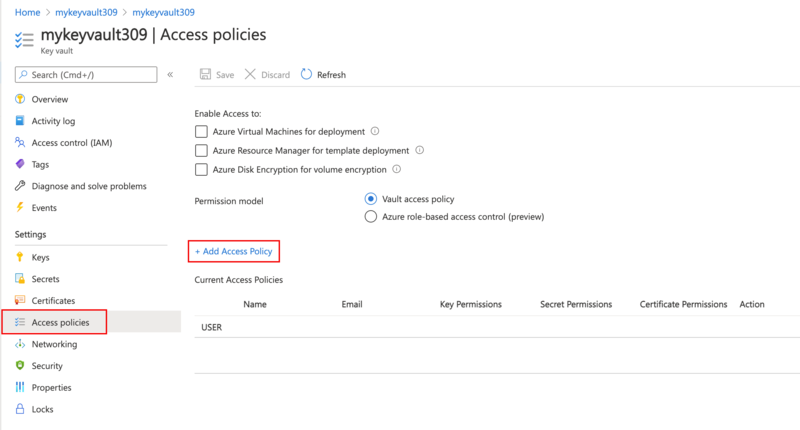 Azure Key Vault アカウントがない場合は作成します。Create an Azure Key Vault account if you don’t have one. 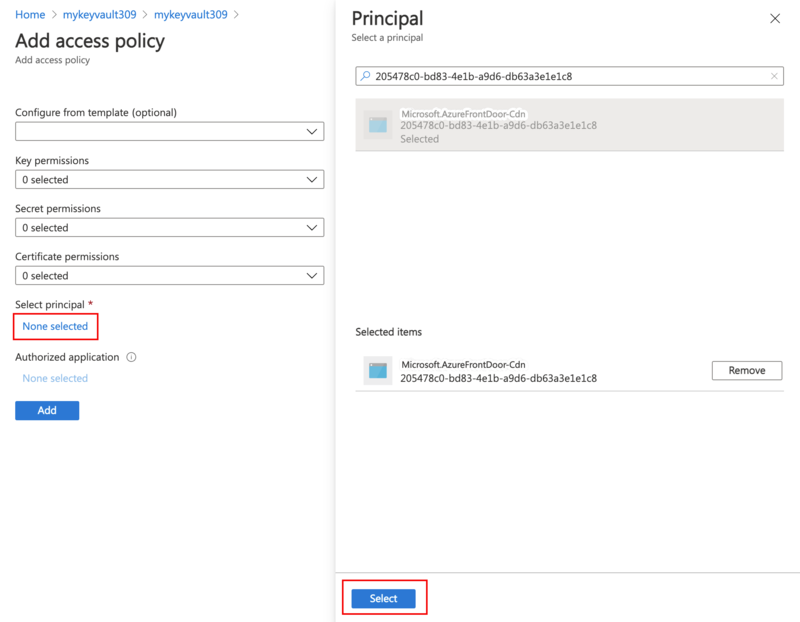 Azure Key Vault 証明書: 証明書が既にある場合は、Azure Key Vault アカウントに直接アップロードできます。または、Azure Key Vault と統合されているパートナー CA の 1 つから、Azure Key Vault を使用して新しい証明書を直接作成できます。Azure Key Vault certificates: If you already have a certificate, you can upload it directly to your Azure Key Vault account or you can create a new certificate directly through Azure Key Vault from one of the partner CAs that Azure Key Vault integrates with. PowerShell を使用して、Azure Active Directory に Azure CDN をアプリとして登録します。Register Azure CDN as an app in your Azure Active Directory via PowerShell. 必要があれば、ローカル コンピューターに Azure PowerShell をインストールします。If needed, install Azure PowerShell on your local machine. Azure Key Vault アカウント内の証明書 (シークレット) にアクセスするには、Azure CDN のアクセス許可を付与します。Grant Azure CDN permission to access the certificates (secrets) in your Azure Key Vault account. キー コンテナー アカウントで、[設定] で [アクセス ポリシー]、[新規追加] の順に選択して新しいポリシーを作成します。In your key vault account, under SETTINGS, select Access policies, then select Add new to create a new policy. [プリンシパルの選択] で、205478c0-bd83-4e1b-a9d6-db63a3e1e1c8 を検索し、[Microsoft.Azure.Cdn] を選択します。In Select principal, search for 205478c0-bd83-4e1b-a9d6-db63a3e1e1c8, and choose Microsoft.Azure.Cdn. [選択] をクリックします。Click Select. [シークレットのアクセス許可] で、[取得] を選択して、CDN がこれらのアクセス許可を実行して証明書を取得し、一覧表示できるようにします。In Secret permissions, select Get to allow CDN to perform these permissions to get and list the certificates. Azure CDN は、このキー コンテナーと、このキー コンテナーに格納されている証明書 (シークレット) にアクセスできるようになりました。Azure CDN can now access this key vault and the certificates (secrets) that are stored in this key vault. Azure CDN ポータルに戻り、プロファイルおよびカスタム HTTPS を有効にする CDN エンドポイントを選択します。Return to the Azure CDN portal and select the profile and CDN endpoint you want to enable custom HTTPS. [証明書の管理の種類] で、[Use my own certificate](独自の証明書を使用する) を選択します。Under Certificate management type, select Use my own certificate. キー コンテナー、証明書 (シークレット)、証明書のバージョンを選択します。Select a key vault, certificate (secret), and certificate version. サブスクリプション ID に対するキー コンテナー アカウント。The key vault accounts for your subscription ID. 選択したキー コンテナーの下の証明書 (シークレット)。The certificates (secrets) under the selected key vault. 独自の証明書を使用する場合には、ドメインの検証は必要ありません。When you use your own certificate, domain validation is not required. 「伝達を待機する」に進んでください。Proceed to Wait for propagation. 「カスタム ドメインが CNAME レコードによって CDN エンドポイントにマップされている」に進んでください。Custom domain is mapped to your CDN endpoint. そうではなく、エンドポイントの CNAME レコード エントリがもう存在しない場合、または CNAME レコード エントリに cdnverify サブドメインが含まれている場合は、「カスタム ドメインが CDN エンドポイントにマップされていない」に進んでください。Otherwise, if the CNAME record entry for your endpoint no longer exists or it contains the cdnverify subdomain, proceed to Custom domain is not mapped to your CDN endpoint. カスタム ドメインをエンドポイントに追加するときに、CDN エンドポイントのホスト名にマップする、ドメイン レジストラーの DNS テーブルに CNAME レコードを作成しました。When you added a custom domain to your endpoint, you created a CNAME record in the DNS table of your domain registrar to map it to your CDN endpoint hostname. この CNAME レコードがまだ存在し、そこに cdnverify サブドメインが含まれていない場合は、DigiCert CA は、この CNAME レコードを使用して自動でカスタム ドメインの所有権を検証します。If that CNAME record still exists and does not contain the cdnverify subdomain, the DigiCert CA uses it to automatically validate ownership of your custom domain. 独自の証明書を使用している場合には、ドメインの検証は必要ありません。If you're using your own certificate, domain validation is not required. CNAME レコードの詳細については、CNAME DNS レコードの作成に関するセクションを参照してください。For more information about CNAME records, see Create the CNAME DNS record. CNAME レコードが正しい形式である場合、DigiCert は自動的にそのカスタム ドメイン名を検証し、ご利用のドメイン名に使用する専用の証明書を作成します。If your CNAME record is in the correct format, DigiCert automatically verifies your custom domain name and creates a dedicated certificate for your domain name. DigiCert から検証電子メールが送信されないため、要求を承認する必要はありません。DigitCert won't send you a verification email and you won't need to approve your request. この証明書は 1 年間有効で、有効期限が切れる前に自動更新されます。The certificate is valid for one year and will be auto-renewed before it expires. 「伝達を待機する」に進んでください。Proceed to Wait for propagation. 自動検証には通常、数分かかります。Automatic validation typically takes a few mins. 1 時間以内にドメインが検証されない場合、サポート チケットを開いてください。If you don’t see your domain validated within an hour, open a support ticket. Certificate Authority Authorization (CAA) レコードに DNS プロバイダーが登録されている場合、そこには有効な CA として DigiCert が含まれている必要があります。If you have a Certificate Authority Authorization (CAA) record with your DNS provider, it must include DigiCert as a valid CA. ドメイン所有者は CAA レコードで、その DNS プロバイダーとともに、ドメインの証明書を発行する権限のある CA を指定できます。A CAA record allows domain owners to specify with their DNS providers which CAs are authorized to issue certificates for their domain. CA は、ドメインの証明書の依頼を受け取っても、そのドメインに CAA レコードがあり、そこに認証された発行者としてその CA がリストされていない場合は、そのドメインまたはサブドメインへの証明書の発行が禁じられます。If a CA receives an order for a certificate for a domain that has a CAA record and that CA is not listed as an authorized issuer, it is prohibited from issuing the certificate to that domain or subdomain. CAA レコードの管理については、「Manage CAA records」(CAA レコードを管理する) をご覧ください。For information about managing CAA records, see Manage CAA records. CAA レコード ツールについては、「CAA Record Helper」(CAA レコード ヘルパー) をご覧ください。For a CAA record tool, see CAA Record Helper. エンドポイントの CNAME レコード エントリがもう存在しない場合や、CNAME レコード エントリに cdnverify サブドメインが含まれている場合は、この手順の残りの部分に従ってください。If the CNAME record entry for your endpoint no longer exists or it contains the cdnverify subdomain, follow the rest of the instructions in this step. 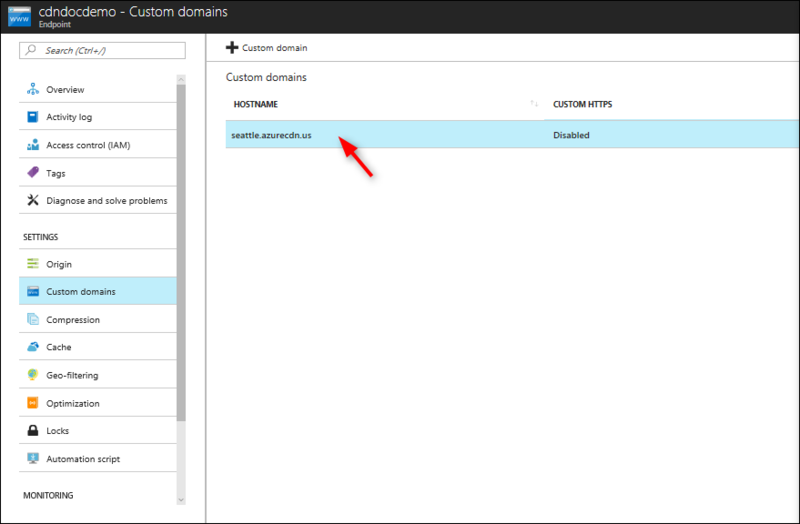 カスタム ドメイン所有権のメール検証は現在、Azure CDN from Akamai のプロファイルでは利用できません。Email validation of custom domain ownership is currently unavailable for Azure CDN from Akamai profiles. 現在、この機能は未着手となっています。This feature is currently in our backlog. カスタム ドメインの HTTPS を有効にする要求が送信されると、DigiCert CA は、ドメインの WHOIS 登録者情報に従って、ドメインの登録者に連絡し、ドメインの所有権を検証します。After you submit a request to enable HTTPS on your custom domain, the DigiCert CA validates ownership of your domain by contacting its registrant, according to the domain's WHOIS registrant information. 連絡は、WHOIS に登録されているメール アドレス (既定) または電話番号で行われます。Contact is made via the email address (by default) or the phone number listed in the WHOIS registration. HTTPS をカスタム ドメイン上でアクティブにする前に、ドメインの検証を完了する必要があります。You must complete domain validation before HTTPS will be active on your custom domain. ドメインの承認には 6 営業日が必要です。You have six business days to approve the domain. 6 営業日以内に承認されない要求は、自動的に取り消されます。Requests that are not approved within six business days are automatically canceled. 数分以内に、要求の承認を求める次の例のようなメールを受け取ります。You should receive an email in a few minutes, similar to the following example, asking you to approve the request. スパム フィルターを使っている場合は、admin@digicert.com をホワイトリストに追加してください。If you are using a spam filter, add admin@digicert.com to its whitelist. 24 時間以内にメールが届かない場合は、Microsoft のサポートに問い合わせてください。If you don't receive an email within 24 hours, contact Microsoft support. contoso.com などの同じルート ドメインに対して同じアカウントを使って、今後行われるすべての依頼を承認することができます。You can approve all future orders placed through the same account for the same root domain; for example, contoso.com. 同じルート ドメインのカスタム ドメインを追加する予定の場合は、このアプローチを使用することをお勧めします。This approach is recommended if you plan to add additional custom domains for the same root domain. この要求で使われる特定のホスト名のみを承認できます。You can approve just the specific host name used in this request. その後の要求では追加の承認が必要になります。Additional approval is required for subsequent requests. 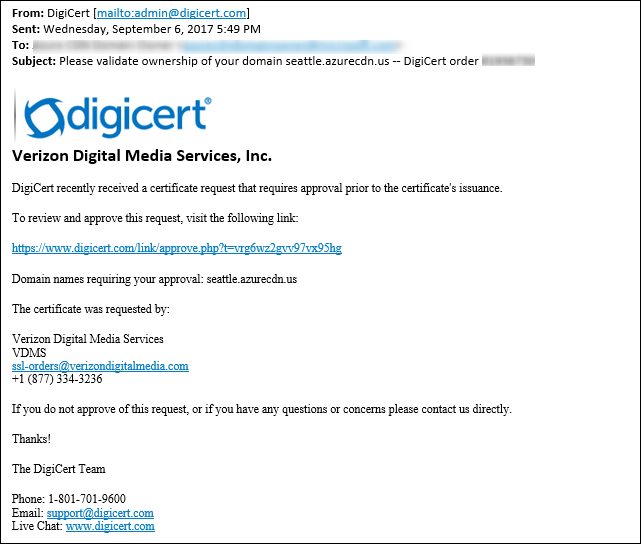 承認後、カスタム ドメイン名に使用される証明書の作成が完了します。After approval, DigiCert completes the certificate creation for your custom domain name. この証明書は 1 年間有効で、有効期限が切れる前に自動更新されます。The certificate is valid for one year and will be auto-renewed before it's expired. ドメイン名の検証後、カスタム ドメインの HTTPS 機能がアクティブになるまでに最大 6 ～ 8 時間がかかります。After the domain name is validated, it can take up to 6-8 hours for the custom domain HTTPS feature to be activated. プロセスが完了すると、Azure Portal の [カスタム HTTPS] のステータスは [有効] に設定され、[カスタム ドメイン] ダイアログの ４つの操作ステップが完了としてマークされます。When the process is complete, the custom HTTPS status in the Azure portal is set to Enabled and the four operation steps in the custom domain dialog are marked as complete. カスタム ドメインは、HTTPS を使う準備ができました。Your custom domain is now ready to use HTTPS. 次の表は、HTTPS を有効にするときの操作の進行を示したものです。The following table shows the operation progress that occurs when you enable HTTPS. HTTPS を有効にした後、[カスタム ドメイン] ダイアログには 4 つの操作ステップが表示されます。After you enable HTTPS, four operation steps appear in the custom domain dialog. 各ステップがアクティブになると、進行状況に合わせてステップの下にサブステップの詳細が追加表示されます。As each step becomes active, additional substep details appear under the step as it progresses. これらのサブステップのすべてが発生するわけではありません。Not all of these substeps will occur. ステップが正常に完了すると、横に緑色のチェック マークが表示されます。After a step successfully completes, a green check mark appears next to it. HTTPS 要求を送信しています。Your HTTPS request is being submitted. HTTPS 要求を正常に送信しました。Your HTTPS request has been submitted successfully. 2 ドメインの検証2 Domain validation CNAME で CDN エンドポイントにマップされている場合、ドメインは自動的に検証されます。Domain is automatically validated if it is CNAME mapped to the CDN Endpoint. そうでない場合、登録レコードに記載されているメール アドレス (WHOIS 登録者) に、検証要求が送信されます。Otherwise, a verification request will be sent to the email listed in your domain’s registration record (WHOIS registrant). できるだけ早く、ドメインを検証してください。Please verify the domain as soon as possible. ドメインの所有権が正常に検証されました。Your domain ownership has been successfully validated. 3 証明書のプロビジョニング3 Certificate provisioning 証明機関は現在、ドメインで HTTPS を有効にする際に必要な証明書の発行処理を進めています。The certificate authority is currently issuing the certificate needed to enable HTTPS on your domain. 証明書の発行が完了しました。現在、証明書を CDN ネットワークにデプロイしています。The certificate has been issued and is currently being deployed to CDN network. これには最大 6 時間かかることがあります。This could take up to 6 hours. CDN ネットワークに証明書をデプロイしました。The certificate has been successfully deployed to CDN network. 4 完了4 Complete ドメインで HTTPS を有効にしました。HTTPS has been successfully enabled on your domain. * このメッセージは、エラーが発生しない限り表示されません。* This message doesn't appear unless an error has occurred. Azure Portal で、お使いの Azure CDN Standard from Microsoft、Azure CDN Standard from Verizon または Azure CDN Premium from Verizon プロファイルを参照します。In the Azure portal, browse to your Azure CDN Standard from Microsoft, Azure CDN Standard from Verizon or Azure CDN Premium from Verizon profile. エンドポイントの一覧で、カスタム ドメインを含むエンドポイントをクリックします。In the list of endpoints, click the endpoint containing your custom domain. HTTPS を無効にするカスタム ドメインをクリックします。Click the custom domain for which you want to disable HTTPS. [オフ] をクリックして HTTPS を無効にした後、[適用] をクリックします。Click Off to disable HTTPS, then click Apply. カスタム ドメインの HTTPS 機能を無効にした後、適用されるまでには最大 6 から 8 時間かかります。After the custom domain HTTPS feature is disabled, it can take up to 6-8 hours for it to take effect. プロセスが完了すると、Azure Portal の [カスタム HTTPS] のステータスは [無効] に設定され、[カスタム ドメイン] ダイアログの 3つの操作ステップが完了としてマークされます。When the process is complete, the custom HTTPS status in the Azure portal is set to Disabled and the three operation steps in the custom domain dialog are marked as complete. カスタム ドメインは HTTPS を使うことができなくなります。Your custom domain can no longer use HTTPS. 次の表は、HTTPS を無効にするときの操作の進行を示したものです。The following table shows the operation progress that occurs when you disable HTTPS. HTTPS を無効にした後、[カスタム ドメイン] ダイアログには 3 つの操作ステップが表示されます。After you disable HTTPS, three operation steps appear in the Custom domain dialog. 各ステップがアクティブになると、ステップの下に詳細が追加表示されます。As each step becomes active, additional details appear under the step. ステップが正常に完了すると、横に緑色のチェック マークが表示されます。After a step successfully completes, a green check mark appears next to it. 証明書プロバイダーはだれですか。どのような種類の証明書が使用されますか。Who is the certificate provider and what type of certificate is used? Azure CDN from Verizon と Azure CDN from Microsoft のどちらの場合も、カスタム ドメインには、Digicert から提供される専用かつ単一の証明書が使用されます。For both Azure CDN from Verizon and Azure CDN from Microsoft, a dedicated/single certificate provided by Digicert is used for your custom domain. IP ベースと SNI のどちらの TLS/SSL を使用しますか。Do you use IP-based or SNI TLS/SSL? Azure CDN from Verizon と Azure CDN Standard from Microsoft のどちらも、SNI TLS/SSL が使用されます。Both Azure CDN from Verizon and Azure CDN Standard from Microsoft use SNI TLS/SSL. DigiCert からドメインの検証電子メールが送られて来ない場合はどうすればよいでしょうか。What if I don't receive the domain verification email from DigiCert? エンドポイントのホスト名を直接指す、カスタム ドメインの CNAME エントリがある場合 (かつ、cdnverify サブドメイン名を使用していない場合)、ドメインの検証電子メールは送られてきません。If you have a CNAME entry for your custom domain that points directly to your endpoint hostname (and you are not using the cdnverify subdomain name), you won't receive a domain verification email. 検証は自動的に行われます。Validation occurs automatically. そうではなく、CNAME エントリがないうえに 24 時間以内にメールが届かなかった場合、Microsoft のサポートに問い合わせてください。Otherwise, if you don't have a CNAME entry and you haven't received an email within 24 hours, contact Microsoft support. SAN 証明書を使用すると専用証明書の場合よりも安全性が低くなるでしょうか。Is using a SAN certificate less secure than a dedicated certificate? SAN 証明書は、専用証明書と同じ暗号化およびセキュリティ標準に従っています。A SAN certificate follows the same encryption and security standards as a dedicated certificate. 発行されるすべての SSL 証明書に SHA 256 を使用して、サーバーのセキュリティが強化されています。All issued SSL certificates use SHA-256 for enhanced server security. 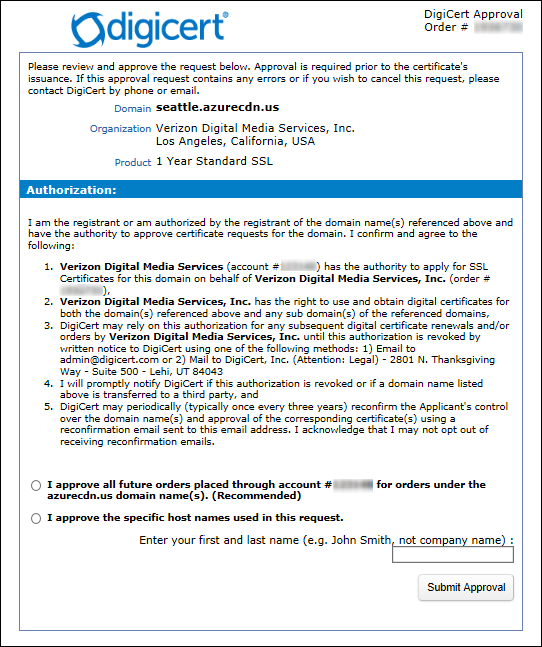 DNS プロバイダーに Certificate Authority Authorization レコードが必要ですか。Do I need a Certificate Authority Authorization record with my DNS provider? いいえ、Certificate Authority Authorization レコードは、現在必要ではありません。No, a Certificate Authority Authorization record is not currently required. ただし、所持している場合は、そこには有効な CA として DigiCert が含められている必要があります。However, if you do have one, it must include DigiCert as a valid CA. 2018 年 6 月 20 日以降、Verizon の Azure CDN で、SNI TLS/SSL による専用証明書が既定で使用されます。SAN (Subject Alternative Name: サブジェクトの別名) 証明書と IP ベースの TLS/SSL を使用している既存のカスタム ドメインはどうなるのでしょうか。On June 20, 2018, Azure CDN from Verizon started using a dedicated certificate with SNI TLS/SSL by default. What happens to my existing custom domains using Subject Alternative Names (SAN) certificate and IP-based TLS/SSL? Microsoft の分析の結果、アプリケーションに対する要求が SNI クライアント要求だけであることがわかった場合、既にあるドメインは今後数か月内に単一の証明書へと徐々に移行されます。Your existing domains will be gradually migrated to single certificate in the upcoming months if Microsoft analyzes that only SNI client requests are made to your application. アプリケーションに対する非 SNI クライアント要求が Microsoft によって検出された場合、ご利用のドメインは、IP ベースの TLS/SSL による SAN 証明書のまま維持されます。If Microsoft detects there some non-SNI client requests made to your application, your domains will stay in the SAN certificate with IP-based TLS/SSL. どちらの場合でも、クライアントの要求に対するサービスやサポートは、それらの要求が SNI か非 SNI かにかかわらず中断されません。In any case, there will be no interruption to your service or support to your client requests regardless of whether those requests are SNI or non-SNI. 次のチュートリアルに進み、CDN エンドポイントでキャッシュを構成する方法を学習してください。Advance to the next tutorial to learn how to configure caching on your CDN endpoint.